Are European importers taking advantage of the low Rand? 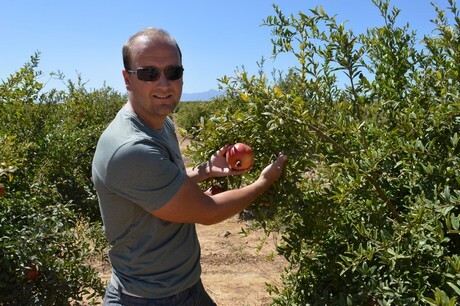 Pomegranates are one of the hot, trendy fruits at the moment and South African growers are getting in on the action. 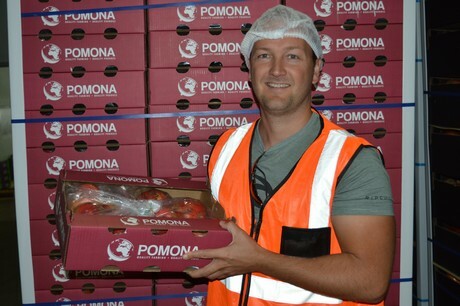 Brent Geddes from Pomona invited us along to take a look at his orchards and the packhouse Fruit2U, where his fruit is packed. 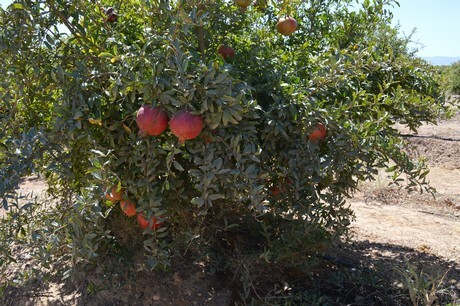 Pomona begun harvesting pomegranates around mid-February, Brent has 100 hectares of Wonderful and Herskovitch pomegranates. Water is a major issue in South Africa at the moment and there are shortages in the Eastern Cape especially. 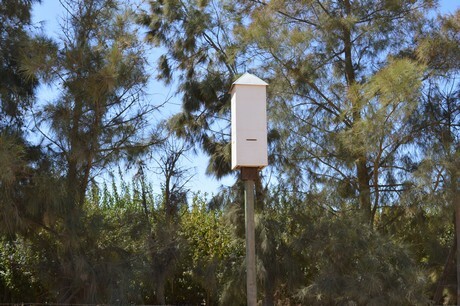 “We have one borehole that supplies water to this entire 80 hectare site. The Marmsbury fault that runs under this whole Swartland area, and if you can tap into one of the strong veins, you will have plenty of water,” explains Brent. The earlier Herskovitch variety has already been harvested. Although the Herskovitch is a great variety, with a lovely colour, it gives a lot of quality issues according to Brent. He is planning to take out about 15 hectares and replant with the Wonderful variety. 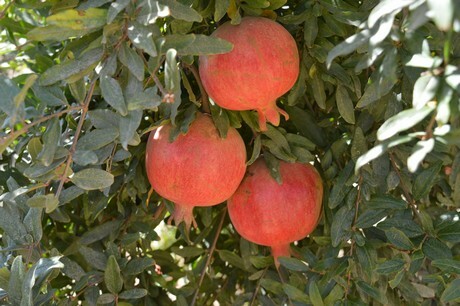 The harvest period for pomegranates is very short starting mid February and ending in April. Pomegranate harvest is best done before the rains. One issue is that people won’t come out and pick in the rain. The other issue is that too much water too quickly during the harvest period is not good for the quality of the fruit, as it leads to fruit cracking. 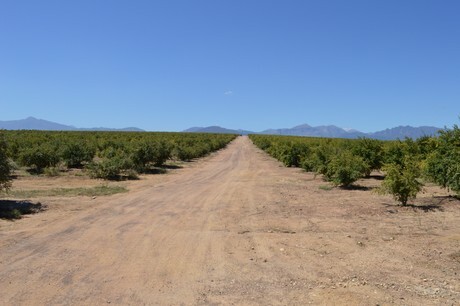 The European market has been a very strong one for South African fruit in the past, and South African growers have always benefited from the Rand being a little weak. However, things may be changing, and Geddes explains that in their main markets, Europe and the UK, importers could be taking advantage of the Rand having depreciated so much this year. He said that they are hearing that the markets are incredibly short, no-one can find supplies of pomegranates, and there is very little on the Rotterdam market, very little in Singapore. But according to Brent the Europeans are digging in their heels and saying they will pay 20-30% less than last year in Euros because they know everyone is ultimately going to buckle and as they are still making 10% more in Rands than last year, but in fact they could be making 40-50% more. When asked if South African growers would stand together and fight back, Geddes said: “We can’t really, because the market here is not that close, and it seems to be quite competitive. So we’re finding that its a bit fragmented. Most of the pomegranates are sold through export companies which are separate from the growers who are not that up on the exchange rate and Euro prices. 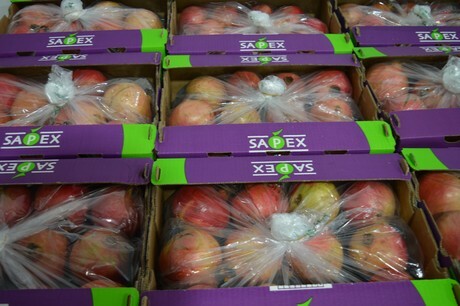 “Russia want the big fruit, Hong Kong too, but because this year has been a small fruit year due to the drought we’re not getting enough of the big fruit to send to them, but they would be willing to pay the price if we could produce the big fruit,” explained Geddes.